Everything cereal heiress Marjorie Merriweather Post collected had to have a royal connection (an effort to overcome her industrial origins, perhaps, a docent suggested). She started in the 1920s with Louis XV and Louis XVI furniture — the kind that actually belonged to Louis XV and Louis XVI — for her New York City apartment. She came to DC and to much of her Russian imperial collection via her third husband, who was a DC lawyer and ambassador to the Soviet Union during the 1930s, when the Bolsheviks were selling off everything associated with the Russian aristocracy. 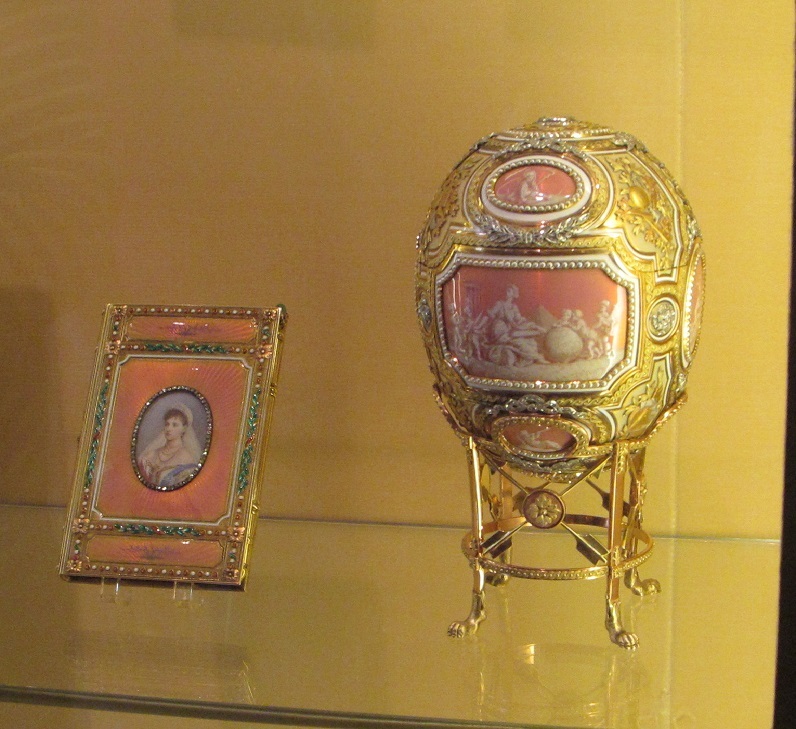 This Faberge egg was made for Tsar Nicholas II to give to his mother for Easter. Marjorie bought the property that would become Hillwood Estate, Museum and Gardens in 1955, after she divorced the DC lawyer. And almost from the beginning, she intended to turn it into a museum. She left the estate and its contents to the Smithsonian when she died but they, believing that her endowment would not sustain it, rejected it. It went to the Post Foundation, which runs it today. I think that Hillwood, with its decorative objects actually decorating a house, would so much better serve the Smithsonian than another museum on the Mall. But I’m not in the museum business so what do I know. The Smithsonian did keep some stand-alone objects that they inherited from her, like a pair of earrings that belonged to Marie Antoinette. We went into the house to catch a lecture on and in Marjorie’s bedroom, where we finally found Patricia’s friend, doing crowd control. I could write hundreds of pages on the house and its objects, and that’s just about the things that I remember. My memory is the worst so that gives you an idea of just how much stuff is there. But let me show you my favorites. 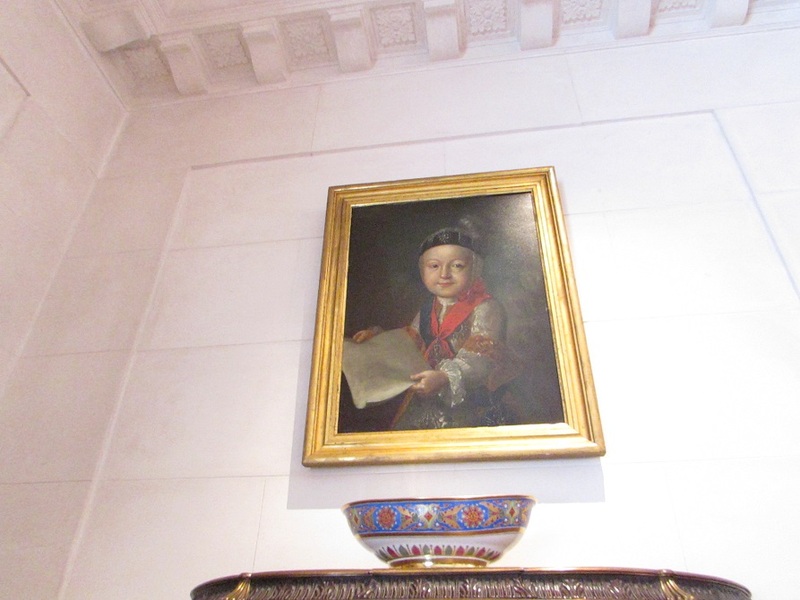 My favorite painting was of a little boy in Tartar (?) dress. Patricia’s friend said that it was of a son of Catherine the Great. My favorite room was the dining room. That’s the flower arrangement I mentioned in the previous post. Can you believe it’s real? The china is Sevre, made for a cardinal-prince in 1771. 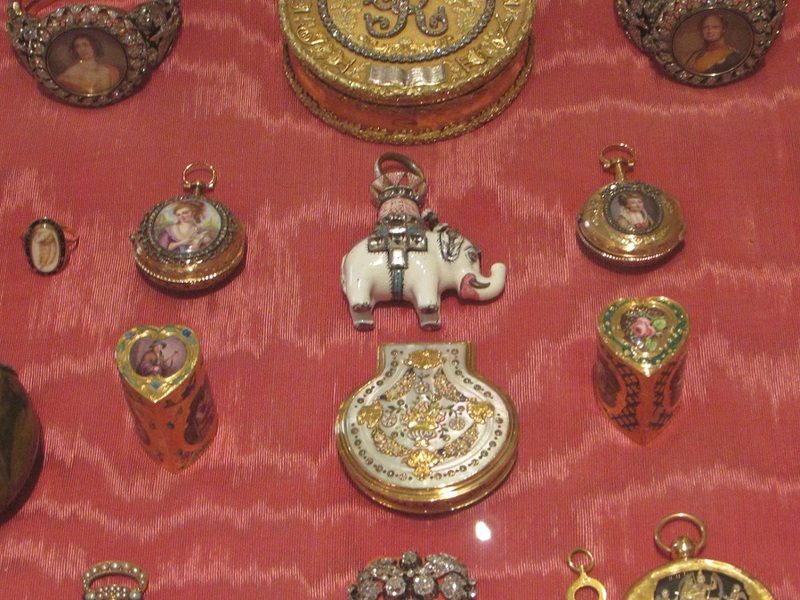 My favorite object was this elephant box. I don’t know why I want it, but I do. I have to mention here that the docents at Hillwood all seemed super knowledgeable and approachable — the docent in this room went into the provenance of each piece in this display case in detail. For me, docents and tour guides can make or break a visit and Hillwood’s definitely made it. In another one of the dependencies, there was a drool-worthy special exhibit (on until the end of December) of Marjorie Post’s Cartier jewels. A few of the dresses that she wore with the jewels are also there, as well as portraits of Marjorie wearing the jewels and the dress. It’s a neat touch that pulls everything together. I’m not a huge fan of 18th century French decorative arts. It’s generally too fussy and shiny for me. But while Marjorie’s style of decorating isn’t mine (and would never be, even if I had the means to achieve it), even I can admit that the French collection is stunning. I like the Russian imperial aesthetic — which seems to be French but modified with an Asian restraint — much more. The history tourist in me also loves the “Bolsheviks selling off the royal Russian goods” part of the story. Hillwood’s slogan is: “Where fabulous lives.” Whoever came up with that should get a huge bonus, because (1) it’s a perfect catch phrase; and (2) that pretty much sums it up. 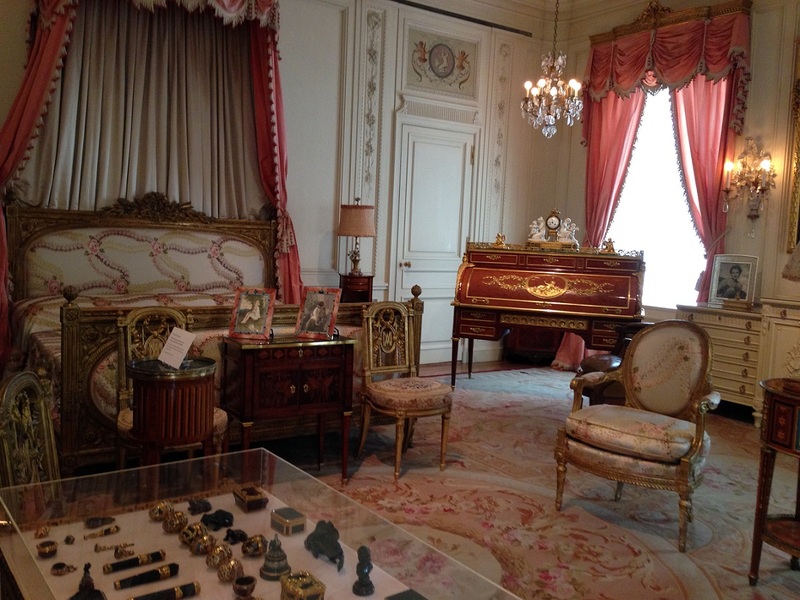 Gallery | This entry was posted in Washington DC and tagged Faberge, French decorative arts, house museum, Marjorie Merriweather Post, Russian decorative arts. Bookmark the permalink. Wow. All I can say is wow. The egg is stunning, and the little elephant box is cool too! It was an amazing collection. I need to go back because it just wasn’t possible to see it all in one day. That glass flower arrangement is breathtaking. Just amazing what an artist can do with glass. Her decorating style is so opulent, but have to say, it does look wonderful. I don’t feel the urge to move in, but would love to spend a weekend! OK, just realized that flower arrangement is REAL. So many art pieces, it actually registered in my brain as man-made. Those arrangements are all around the place. I admit that I actually touched the arrangement in the visitor center to see if they were real. They have an amazing cutting garden, where they get the flowers for the arrangements. 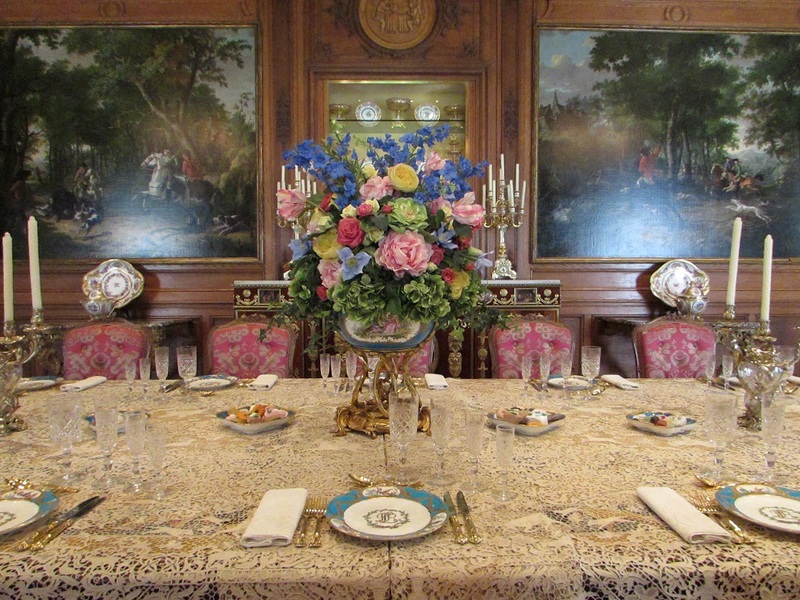 Thanks to your posts, Hillwood is on my list of places to visit next time I am in DC. Nice work on the photographs. The floral arrangement is out of this world. I couldn’t recommend Hillwood more highly. It’s such a remarkable collection. Hope you’ll enjoy it as much as I did. Looks a bit OTT for my taste. Not quite Shaker is it? Off to read part one now. Me too. Much prefer the Shaker aesthetic.